Vistaprint Corporate offers custom printing service for businesses. They provide great customer service! Every-time we have problems with our website, the customer service team are always very patient and willing to assist us. Sometimes it takes up to an hour of call to fix our website, the customer service team has been very professional in assisting our needs. The design system isn't good enough. It seems like this company is new at creating websites, so there are many things that they have not yet developed (or catch up with the other companies). Their technology isn't as advanced. We have been having a lot of trouble with the formats, and they said that all of their customers are experiencing the same issue. So the engineers are working on it, but they could not provide a time table on when it will be resolved. The website they designs are very simple. Don't expect anything too professional or fancy looking. We are starting our online marketing and used Vistaprint to upgrade a new website design. "Good experience but still a work in progress"
Great discounts on items, better organization to our templates. We have 24+ unique brands so having them organized by brand is great. The discounts are great as well. We've had an outstanding issue for over a month that still has not been resolved. When I followed up on it, was just told it's still not done yet. Seems like a very long time table to fix a pricing issue that would tentatively make someone look elsewhere. You are expected to just pay the annual fee (very low)for the product sight unseen which seems strange to me. When I want to add a new template it's not as easy/detailed as their regular site, so I typically build something out in the regular site and have our account rep move it over for me which can take a couple of days. They're very helpful with this but it still isn't instantaneous like the regular portion of their website would be. It takes some time to set up. Having a great account rep helps - ours is very responsible and helpful. The set up fee is very low and you pretty much make it back within your first couple of orders. Ordering our branded supplies in bulk. It's a great discount, the site is much more organized to use for a company with 24+ unique brands than ordering on their main site. "How do I end this 2-month-long nightmare?" I like the idea of what this could be. If it worked properly, it would have been a great tool for my clients. My experience has made me so upset that it literally keeps me awake at night. I had a client ask me to find the best way for his team to share designs and get cards printed. At face value, that's what ProShop seemed to offer. Two months later, I'm actually losing sleep over the fact that these projects are still not complete, acceptable, or usable. First, we were provided with a list of acceptable file types we could send our designs in. We sent our designs in one of those file types. After 2 weeks of radio silence, our rep told us they couldn't use them. We had to recreate all of our designs from scratch - which we would never have had to do if they had given us proper specs up front. The rep kept asking us to repeat answers to questions she should have known the answer to. More weeks went by without updates, responses, or proper communication unless I specifically requested it. The end product is haphazard and sloppy. We have no control over being able to correct their mistakes. Fields that should be editable are not, and fields that should not be editable are. I am embarrassed that I recommended this to my client. They've been paying for this service for two months and have not been able to get a single thing printed. I wish I had never laid eyes on this system. We've realized no benefits. Awful communication, no guidance from the sales rep, and a glib, impersonal response to my concerns. I told my rep we were upset it was taking so long, and her response was that it had taken a while to get the designs from my team. We would have designed them correctly the first time if you had given us the proper files types! I like the variety of options, the quick turn around time and the reasonable prices offered by Vista Print. The customer service at Vista Print is better than most companies. There are times that I am unable to locate an item I wanted. I have had to call customer service on more than one occasion. They have always been helpful to solve any problems I had quickly and with a great attitude. Make sure to verify that what you are uploading is correct. Vista Rent is great at correcting any issues, but it saves time in the long run if you get it right the first time. Never hesitate to contact Customer service, they are always helpful and solve you problems quickly. We are able to have a variety of cards printed for the office. Making it easy to let possible patients know about us. "Great tool for our small to medium sized business"
The portal remembers my orders and past information as well as the discounts for the things I order are really helpful. I was never a Vis Print fan, but now I'd say that has changed. I think the coding on the site could be improved. Little glitchy things happen all the time and I think it would greatly be beneficial if the site ran more smoothly. It is good to use if you need help getting things here and there for your office that are personalized with your company info. The discounts are great and the usability behind the whole thing is great. I don't use the function of having them print our business cards and their design team adding different information, but I can see the huge advantage if a company didn't have a bigger marketing team. "Great for Small to Medium Companies that Need Printing"
You cannot automatically update things into your portfolio, you have to sent it to your contact and their team will get it into your portal. It just takes a longer period of time than just uploading your design and checking out. Do it - there is no cost to you and you get deals on top of the very fair pricing Vistaprint offers. Giving our company a lot of opportunity to brand our small firm in a very popular market. Getting unique and custom printing done for a small fee. There are a lot of things that can be printed - no just business cards. We have used them for our company Holiday cards, welcome post cards, banners, etc. "Andria Mitros is the BEST!" Andria. She is so awesome and helped me with so much! From moving items, to familiarizing me with the system. She was always patient and was a great help whenever there were any issues. Everything was always done in a timely manner. I like designing my products on the regular site better than on the corporate site. I usually design on the regular site and then have the item moved to corporate. It's easier to navigate on the normal site in my opinion. I love having a pro shop and being able to save items in categories. It makes it quick and easy to re-order any items. Ease and the ability to order products on my own schedule. More often than not, the quality of the products I have received has been unacceptable -- from colors being wrong, to weird printing issues that have rendered products unusable. I have had several different reps that changed at the drop of a hat with no explanation, one of whom never responded to me. I had to call and ask to speak to a supervisor before I was assigned my third rep, who was slightly more responsive, but not by much. When I had a major issue with a product while traveling, I was left with no solution, leaving me with embarrassing items to hand out at a national conference. I cced the supervisor I spoke to on the email about that product, in which I told my rep how unhappy I was and how I was no longer interested in using the service, and no one followed up with me. Leads me to believe they are either way busier than they can handle or they just don't care about customer retention. I was expecting this service to be a better option than the regular VistaPrint that would make my life easier, but it only added more headaches. I have since stopped using the service and have given my company's business to a different printing company. If you need no support and aren't concerned about quality of products, this could work for you, but it's unacceptable for a professional business. This service made my problems worse. Only benefit is cheaper shipping and product costs, but it seems the quality of the products is actually worse than the regular VistaPrint portal. Thank you for taking the time to review Vistaprint Corporate. We are very sorry to hear about your experience. This is certainly not the standard of service we strive to provide our customers. Customer satisfaction is very important to us and we apologize that we failed to meet your needs. "A good idea, but lacking"
Editing capabilities aren't great, I actually prefer the regular Vistaprint website. The only order I placed on the corporate site did not come out as great as I wanted and there was an issue with production, which I never have on the regular website. I wish the portal was more customizable to my company's needs, but the two reps I have had are not responsive. Because of reasons listed above, I have not used Vistaprint Corporate much, despite ordering thousands of dollars worth of print product for my company on the regular Vistaprint website. It is a shame, because I love the discounts and free shipping they offer. Thank you for taking the time to review Vistaprint Corporate. We are sorry to hear that you have had a poor experience with customization. Your feedback is greatly appreciated as we work to make improvements to our product offering. We hope that you will continue enjoying business level pricing and free shipping with us. The ability to have customizable templates preloaded. Lucas Austin is one of the biggest assets to the Vistaprint corporate team! He is responsive to every email or question I throw at him even if he does not know the answer right away. When I need new products/ sizes added to the print your own artwork area, I know I can count on him to have it completed by the next business day. Does not allow double-sided PDF uploads and the uploader does not always work correctly (ie: you must place a box around transparent or white edges.) Unless you request the product, not all of the sizes or products are preloaded into the print your own artwork area. That there was not an email/ warning to corporate customers that product prices and shipping were increasing in cost. Streamlined business card ordering. Having multiple locations around the US Vistaprint has allowed our company to have a one-stop shop for our basic printing needs to be met. "My Experience with VistaPrint Corporate"
I have to say that I enjoy the discount the best! The ease of reordering is fantastic. The amount of product choices available. I like the ability to use my logo and make a design from scratch. My orders tend to ship quickly. DISCOUNT is the BEST! Some of the designs use the non-preferred logo. It can be difficult to find my portal. Moving text blocks around can be difficult in knowing where to place so it lines up best. I wish I could resize photo files in the portal. A guided design, editing and reorder tutorial might be nice for new users: it took me a long time before I realized that I could rename edits! I had copy copy copy going for a while! Some of the printed materials can be a little off from order to order, but it's something that I tend to overlook bc of the affordability. Do it, nice discounts, designs done for you, it's great! Business cards, referral program cards, rack cards, window signage, gift cards, we get most of our printed materials from VistaPrint. "Great products - service could be improved"
The products are amazing and reasonably priced. Colors are brilliant. On-line representatives very helpful and friendly when we are asking for design assistance. I have had difficulty with the account managers and have had to express my concerns a few times. They even assigned a new manager to me once...unfortunately did not tell me....and I eventually contacted them to find out why my order had not been processed. I was told I had a new manager and that the 'old manager' had been only there temporarily and so 'obviously' was not receiving my emails. Well, it was not obvious to me. When I expressed my concern over that situation and the original account manager, I found the woman very condescending. She never apologized or even made an attempt to commiserate in anyway. I now have a new account manager and so far things have gone very well. So...to sum it up. First account manager was amazing! Then I was notified I had a new one. She was absolutely awful and did a terrible job. I expressed my concerns about that. Then she went on vacation and I was assigned a temporary one. He apparently returned to his old position when account manager #2 came back from vacation. Unfortunately, no one notified me that I wasn't supposed to be sending letters to him and, of course, account manager #2 never contacted me at all. Now I have account manager #4 who has done well so far. No apologies, no expressions of understanding, lackluster to poor employees who were supposed to handle these situations. Over a month of waiting for products we were supposed to have in less than a week! I would add that we are a Corporate user and I certainly expected a more professional staff to work with. Finally, we have had this corporate account for less than a year and we have already had several issues. A more economical resource for advertising. Allowing us to 'design' our own products and not having to pay for designers. Easy to understand programs for designing products. "We're Utilizing Vistaprint Corporate and We Love It." Being a graphic designer, I love the comprehensive templates available for all orderable items. They completely take the guesswork out of uploading high quality artwork that is the right size the the first try. Overall that saves me a bunch of time. I've uploaded a number of notecard artwork files to our rep for our website and even though it's been a number of months, they are still not on our branded partner site. I have recommended this to a film company and a dragonboat racing group. We have about 100 real estate agents who are able to consistently order approved designs because of the branded partner site. I love that. "Great way to cover printing needs across the country"
We exhibit at conferences across the country. It helps to get the corporate discount, with free shipping and orders filled in a timely manner where I need them to go. It would be nice to have more printing paper options. Vistaprint Corporate is a user friendly product. When they set up the page for your company, it is quick and easy to place orders and it stores addresses for you to quickly access for later use. I have been satisfied with it and they are good about shipping the products without damage. I have regional directors that cover 18 states. I have to send out printed materials for our business for conferences and formal presentations with executives. Having a way to order everything and have it directly shipped where I want it without having to jump through hoops to get it done helps a lot. "Great Custom Vistaprint Store. A few tweaks needed." The portal is convenient and user friendly. The prices are competitive. Customer service is not available all the time, standard 9-5 Monday to Friday. It should be longer hours and 7 days a week like their regular customer service. If they can't do that then let their regular customer service allow access to our accounts to help with any issues we may have. Sales and Marketing Print materials. No need to get 3 quotes from different vendors anymore. "Great portal for creating business cards"
I can create business cards for any employee in a few minutes from their portal that has the template for my business. I struggled to get my card into the non-business part of vista print. Had to call in to get my card in, but once it was in it is very easy to use. Business cards easily updated and printed. The interface is easy to use and the printed business cards have a professional look and feel. Perfect way for our promoters to order personalized items at a reduced cost. 2-part receipt books would be a nice addition to offer. It's a good solution for network marketing companies and many other businesses that have representatives in various locations. You don't have to approve individual requests, deal with shipping, or any other drama. Set it up and send your people to order...that's it. Ideal way for us to provide templates and files for our promoters to access and personalize, while still delivering a consistent look, message, and brand. "Not As Flexible as Promised"
It's not as flexible as they promised. We really wanted to be able to create fliers and brochures, but the templates are too stiff and don't allow for the content flexibility we wanted. Plus they cannot use our fonts. Terrible for a brand. We are able to produce business cards more quickly. "Simplifies and streamlines all my marketing initiatives"
I no longer have to create individual Photoshop print files for every marketing job I have to create. Using the print portal has saved me hundreds of hours, and the quality of the product is exceptional. Initially that I didn't have flexibility, however now that blank templates have been added for me, nothing. I'd love to be able to edit digital marketing materials and have them be available for JPG or PDF download. I need to send out new client materials to every venue we sign on, I used to have to create a unique file and upload for every single venue, now I can just edit the basics and I'm all set! "Great Pricing, Great Products, Below average Service"
The website has lots of options for products. Since Gator has switched to a new sales representative it has been hard to make changes to the cards. Further it is very annoying to not be able to slightly tweak cards on the website without taking 3 days for vistaprint to do it. Lastly it is a pain to access my corporate store. Do not expect anything to happen quickly if needed for a rapid launch. Keep inventory of all promotional items for the lead time is always a bit longer than expected. The sales rep assigned to your account is constantly changing. Some are great others are not. Our business cards pop and standout from the crowd. They contribute to the image of success that Gator strives to achieve through utilizing very high quality products.. Thank you for taking the time to review Vistaprint Corporate. We are sorry to hear that you are having a poor experience with your account representative. 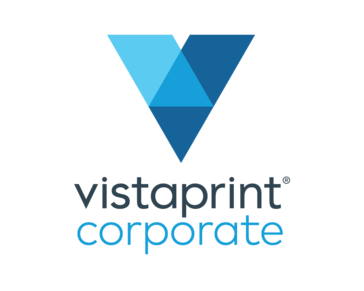 Vistaprint Corporate strives to provide excellent customer service and we want to apologize that we have not met your expectations. I love the fact that Vistaprint Corporate offer a better pricing system so we can wholesale items to customers. Sometimes that pricing system doesn't work and I can get it cheaper as a normal customer with coupons. I would not use this as a primary source for outsourcing but it is a good addition. We are able to outsource to Vistaprint Corporate and save time and money compared to doing it in house. You can tell this is a higher quality product. I think the product could be a little better if they made an effort to make it superior quality. It's always worth a try. Always remember, if you don't like it, you can always stop using it. One stop shop solution. We've realized that being able to get 95% of what we need from one place is very beneficial and time saving. "Customer service is good, quantity is great, quality is so-so"
Value and bang-for-your buck is the best thing about Vistaprint Corporate. Quality is very iffy. Sometimes things come as you expect, sometimes they don't. Customer service is great if you don't like their product though. Buy more, save more is the main benefit we've realized. We solve marketing problems for our clients through the use of Vistaprint Corporate. "Saving time, removing the work..."
What we like about the Vista print corporate portal is that we no longer have to coordinate getting business cards and shirts for our staff. They do it themselves. No real dislikes. The system is easy to use and intuitive. Saves us time and internal resources and the pricing with free delivery is attractive. Massive selection with good quality at a great price. I wish they were a bit more consultative and proactively helped provide solutions. Consolidated several business card programs under one, resulting in a better user experience and cost savings for the company. "Vistaprint is a one stop shop for printing needs!" "The Corporate account is not user friendly. The regular vistaprint website is fantastic." The free shipping and cost but, if you can't create your projects on the site it is more costly. The Customer Service is very good. They respond quickly to questions, however, the purpose of the Corporate account is to save money and work independently and quickly to create and distribute marketing tools. I am not able to do this on this site. Familiarize yourself with the Corporate account before you commit to the $100 fee per year. Make sure ALL of your work transfers over before signing up. Understand and compare prices between the 2 sites. Familiarize yourself with the Promotions that run regularly through the year. "Fast & Easy Business Cards"
I like how the templates are pre-made and we can just input the name, phone number, email and title. I also like free shipping on orders. I do not like that we cannot take advantage of coupons. It says me a lot of time and money. I appreciate that everything is set up and the process is streamlined - eliminating the need for a graphic designer to individually design each piece. We have one issue that is reoccurring and corporate has to contact the sales rep every time. I wish that it could be dealt with one time and changed in the system permanently. Our individual store owners have the ability to order on their own and bypass corporate. Thank you for taking the time to review Vistaprint Corporate. We are sad to hear that you have experienced a recurring issue. We strive to provide excellent customer service and it seems that we have fallen short. Please do not hesitate to reach out to your account representative. They will be happy to assist you. We hope that your individual store owners continue to enjoy their streamlined ordering process. "Always Vista Print has been our ideal choice"
High quality,excellent customer service and has been our partner for last 7 years.Highly recommended. Nothing noted so far,everything looks good.Has been bit expensive at times.Prices could be maintained at competitive rate for business to work with same. Excellent quality of print out delivered by Vistaprint. I wish i could create my own templates with variable information, such as a different format of business card, without having to call and explain it to a rep. I like the corporate personalization that is provided for my company. If I wanted to remove previous purchases or setups (for example for the build of company cards), I can't delete. It stays listed as junk in my list of requests. I like the ability for people to order their own products while maintaining brand consistency and control. The invoices do not show enough information to bill to different cost centers. I also wish that I could create my own templates instead of having them go through the team. Overall this has been a great switch for us. The process for ordering business cards has become more streamlined and faster overall. Customer service, friendliness, keeps me informed, and always organized. Nothing I've come across as of yet, so far in my experiences with Vistaprint everything has been great. Many benefits are offered and we've utilized the services of ordering our business cards. They send out high-quality products quickly and are cost-effective for us! I have no complaints so far the process seems straight forward and easy enough to use. We are able to upload projects to a single webpage where each of our remote employees can pay for what they need when they need it and trust it will be received by the intended date. I love that we have a portal to access for anything we need to print. New hire? Biz cards are all set and ready to ship in minutes. It's a very easy service to use, they are always coming up with new products to add to the portal. Just the time it takes to ship. . . . . . .
We don't have to worry about brand consistency because everything is already set up. "Quick, easy ordering for company branded promo and marketing materials"
We have had several mistakes made on items we have ordered, but they are replaced quickly with the correct items. "VistaPrint Corporate makes it easy to meet my clients needs"
Nothing yet - just getting started! Like it so far. Managing marketing collateral for multiple clients. We're able to get things printed in a timely manner and allows us to quickly check things off our to-do lists for events, company needs ,etc. some additional quantity options would be good. There wasn't too much honestly, with the exception of having all of our marketing collateral, somewhat, available under one umbrella. I disliked the terrible level of customer service received. I rarely was able to speak with someone without waiting 30 minutes. Additionally my invoices are messed up, my account rep was unable to speak with me, ever! Thank you for taking the time to review Vistaprint Corporate. We want to apologize for your poor customer service experience. This is certainly not the level of service that we strive to provide our customers. "Terrific option for a small to mid-sized business"
Inability to oversee/approve orders unless on company invoice. Would prefer users pay by credit card, but still require admin approval on orders. Marketing portal - having flyers and collateral available on line for personalization, printing & drop shipping. Having promotional items available on demand. "The Corporate Portals have saved me so much time!" I enjoy being able to upload company collateral and know that everything printed for all our locations will be consistent. The options for setting design specs are not as extensive as on the live site. The portals have made it easy for all of my locations to order their own collateral when needed. With over 24 locations, it is really nice to have a portal that all can go under to place their print needs. The only thing I have to do is approve them. Very happy! Limited types of products available. I would like to be able to choose from the entire Vistaprint catalog. Ordering business cards at all 24 retail locations. I enjoy my rep Tanelia Stephenson. She is always reliable and she is always happy to help in a prompt manner. The customer service department when my rep was out was not knowledgeable and didn't do what was needed in any matter. Thank you for taking the time to review Vistaprint Corporate. We are happy to hear that you are enjoying working with Tanelia. However, we are disappointed to learn that your experience has been less than optimal while your representative was out of the office. Your feedback is greatly appreciated as we work to make improvements. "Professional team at my side "
VistPrint corporate always answered my calls; worked hard to make templates that suited my company's needs; and maintains great prices with no compromise in quality. I actually have no issues to voice. It's just been a solid experience. The customer service is unbeatable, and the quality of the business cards is great! I wish there was faster shipping options, but 5 day turnaround is still great! Great customer service, and the ability to have employees review their own business cards before printing is a great way to eliminate mistakes. "Not really what we were hoping for"
Having an online store for my agents to order materials would be really cool. The product offerings were not updated when we requested. Agents didn't like the size/options available to them initially. Help agents more easily buy promotional items that are easy to finish designing and easy to order. Thank you for taking the time to review Vistaprint Corporate. We are sorry to hear that you did not find what you were looking for when you were browsing our product options. Your feedback is very helpful as we work to expand our product offerings. "First Class 3rd Party Service Provider"
Nothing. Any problems I ran into were handled fast. What's to dislike? Check them out - And if you need real person help - Call; you won't be disappointed. Ability to easily distribute support materials at zero cost. * We monitor all ProShop reviews to prevent fraudulent reviews and keep review quality high. We do not post reviews by company employees or direct competitors. Validated reviews require the user to submit a screenshot of the product containing their user ID, in order to verify a user is an actual user of the product. Hi there! Are you looking to implement a solution like ProShop?